Enjoy an anthology of stories centered around Camelot and King Arthur! 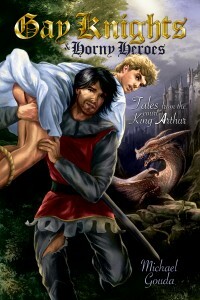 Gay Knights and Horny Heroes: Tales from King Arthur’s Court (m/m) by Michael Gouda, available from Dreamspinner Press. The timeless tales of King Arthur have been told throughout the ages as sterling examples of bravery, manhood, and heart-searing romance. But really, we know it’s all about the men. Here we have a re-imagined landscape of Arthurian love stories, a place in which contests of strength become contests of foreplay, a knight’s favored squire may be his equally favored bedmate, and Lancelot is given his rightful place in history: at Arthur’s side and in his bed, for as long as the two shall live.